Rascal is a senior gal dealing with some arthritis and generalized discomfort. She came to see us because she was struggling with her normal activities and just didn’t have that pep in her step like she once had. Her fur mom wanted to avoid putting her on medications long term and was looking for a natural way to make her baby a bit more comfortable. When Rascal first came to see us she was walking with an unsteady and obviously uncomfortable gait. She was slow moving and really struggled to get herself up and down. During her first adjustment Rascall just completely relaxed. She plopped on down and allowed a full workup! Her mom brought her back to see us one week later and what a difference that week had made! 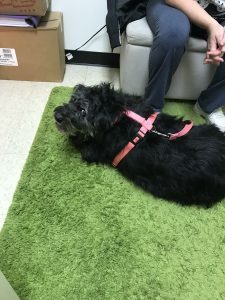 Rascal walked in with vigor, was able to handle the tile floor without any trouble and was able to sit/stand much easier than the previous week. Her mom tells us she has been spunky as ever, her hind legs seemed stronger and she was way more energetic. Sometimes the simplest things can give our senior dogs a new lease on life!